Horace Dean was an avid fan of D&H cabooses and had been collecting photos of each he could find, either by taking the photo himself or by obtaining a copy wherever he could. The photos on the page are due in large part to Horace, and as such, this page is dedicated to his memory. They were built by O. F. Jordan Co. for the primary purpose of spreading ballast in the track, and clearing ditches (with those big wings). The D&H bought them with the V-plow nose to use them for snow removal as well, and they worked well for that. The wings were also used to clear snow from side tracks and yard tracks. Some of the spreaders, at least the one at Carbondale, had a "double track" nose, an extra wing mounted on the left side of the V so all the snow was plowed to the right, away from the adjacent track. 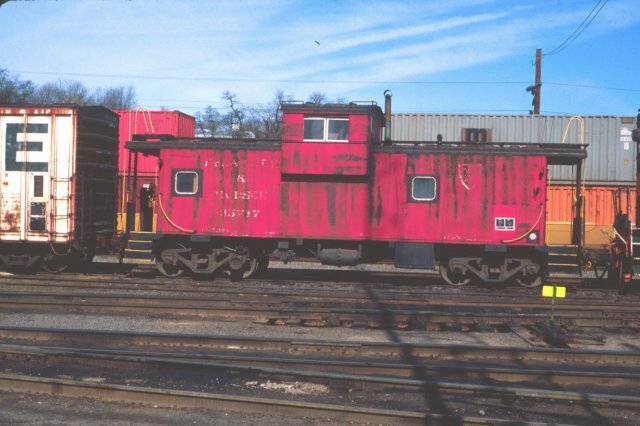 The "Pink Spreader," the #35057, was actually faded D&H red. It came from the Rutland RR about 1961 or 1962, and from then at least until 1969 it stayed at Rouses Point. When I was Track Supervisor at Plattsburgh, we kept it painted green with yellow trim (by keeping it out of Colonie) and touched up the paint every spring. Normally, the spreaders went to Colonie every fall for overhaul before the winter season, but we conspired with the Mechanical Department at Rouses Point to do all the work up there so we could keep the spreader set up the way we wanted it. It had a special headlight power connection to the locomotive, a direct air connection to the locomotive main air reservoir, a feed valve (reducing valve) on its air tank, a propane stove for the cab, a propane torch for thawing the works, and an air windshield wiper. It was the Hot Rod of all the D&H spreaders. When it snowed and blowed in Canada, we would make two round trips a day to Delson, ahead of 9 and 35, run around the balloon track, and return to Rouses Point ahead of 34 and 10, usually pushed by NJ engine #4050 or #4051, or both if it was real bad. We ran about 35 mph with snow flying everywhere, and we had to know where the crossings and switches were so we could raise the nose in time. The flanger signs were sometimes hidden in the snow, even though the Lacolle section gang did very well at keeping them in place. We made the worst coffee in the world on that propane stove, but it kept us warm in the cab. 35214 Safety Instruction Car converted from a "Miner's Coach"
35719 Steel, Wide Vision 6/1959 International Car Co.
35791 Steel, Wide Vision 10/23/1971 International Car Co.
35792 Steel, Wide Vision 10/23/1971 International Car Co.
35793 Steel, Wide Vision 10/23/1971 International Car Co.
35794 Steel, Wide Vision 10/23/1971 International Car Co.
35795 Steel, Wide Vision 10/23/1971 International Car Co.
35796 Steel, Wide Vision 10/23/1971 International Car Co.
35797 Steel, Wide Vision 10/23/1971 International Car Co.
35798 Steel, Wide Vision 10/23/1971 International Car Co.
35799 Steel, Wide Vision 10/23/1971 International Car Co.
35800 Steel, Wide Vision 10/23/1971 International Car Co.
Cabins, Crummies & Hacks, Vol. 1, p. 41 circular "porthole"
D&H in 1986 D&H Color Guide, p. 39 circular "porthole"
Bay Window 1953 International Car Co.
35808 Steel, Bay Window 1970 International Car Co.
35809 Steel, Bay Window 1970 International Car Co.
35810 Steel, Bay Window 1970 International Car Co.
35811 Steel, Bay Window 1970 International Car Co.
35812 Steel, Bay Window 1970 International Car Co.
35813 Steel, Bay Window 1970 International Car Co.
35814 Steel, Bay Window 1970 International Car Co.
35815 Steel, Bay Window 1970 International Car Co.
35816 Steel, Bay Window 1970 International Car Co.
35817 Steel, Bay Window 1970 International Car Co.
At Mechanicville on a cold day in February 1981, waiting for its next call to duty. Photo and scan by Neil C. Hunter. Making a change from the usual all black wreck cranes, the D&H 30021 looks resplendent in its blue and yellow scheme. At Oneonta, NY in April 1989. Reproduced from a Bill Mischler slide, used by permission. 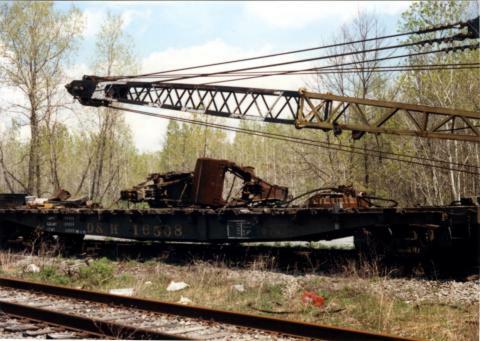 Oneonta wreck train (crane and 2 gondolas). 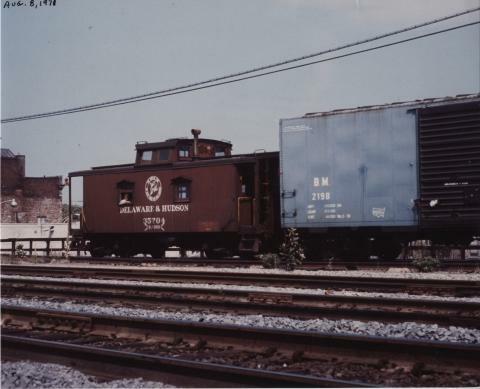 Photo was taken at Steamtown in 1995. Photograph by Jason Dickie, used by permission. Two of the D&H's three test weight cars sit at Kenwood Yard in January 1988. Bill Mischler slide, used by permission. Jordan Spreader #35054. Photograph by Thomas Coyne, obtained from Bob's Photo, used by permission. Jordan Spreader #35055. Photograph by Arthur Mitchell, obtained from Bob's Photo, used by permission. Jordan Spreader #35057, or so it appears. This unit was photographed by Tim Byrne at Rouses Point during a snow storm in 1982. The first in the series and the last in service. Sans cupola, the car is seen in new Spartan lettering with a gray roof at Colonie in July, 1981. Photo by Tony Hodun. Newspaper Clipping recording the movement of D&H #35704 to a new home. Notice the strange circular herald on this caboose and the lack of any number on the side. Port of Albany, NY approximately 2001. Photo by Chris Shepherd. September 1990 in Oneonta Yard, Oneonta, NY. Photo by Chris Shepherd. 1996. Photo by Peter L. Finch. April 1993 in Kenwood Yard, Albany, NY. Photo by Chris Shepherd. May 1991 in Saratoga Yard, Saratoga, NY. Photo by Chris Shepherd. November 1986 in Kenwood Yard, Albany, NY. Photo by Bill Mischler. October 1990 in Saratoga Yard, Saratoga, NY. Photo by Chris Shepherd. July 1999 in Kenwood Yard, Albany, NY. Photo by Chris Shepherd. April 1992 in Port of Albany, NY. Photo by Chris Shepherd. 1995 in Hoboken, NJ. Whippany Railway Museum President Steve Hepler's Delaware & Hudson wood caboose reposes in the cool night air, prior to leaving Hoboken Festival that evening. Photo by Paul R. Tupaczewski. The interior of Steve Hepler’s restored caboose, as it appeared in 2016. Photo by Steve Hepler. Abbott de Rham & Co. Inc. uses the restored caboose as an office for his company. January 1994 in Saratoga Yard, Saratoga, NY. Photo by Chris Shepherd.